Download the pictures from your PhotoPass card to view your special Disney moments. 4 How Can I Block My Child From Going on a Certain Website? 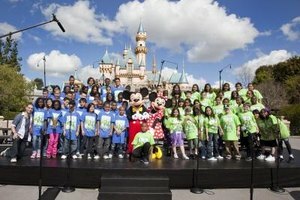 You'll want to capture all the exciting and special moments on your family's vacation to a Disney theme park. Disney offers a PhotoPass service to help you catch those moments. A Disney employee will give you a PhotoPass card with an account number you use to claim your photos later. Photos Disney employees take at any of their parks are later uploaded to your account, and you can download and view them from the PhotoPass website. Go to Disney's PhotoPass website to create an account if you don't have one already. Click "Don't have an account? Get started!" at the top of the page. Select the age of the person who will manage the account under "1st Time Registration" and click "Create New Account." Enter the required registration information on the "Set Up Your New Account" page. This includes an email address, password, Disney PhotoPass ID -- this is the 16-digit number on the back of your PhotoPass card -- and your personal contact information. Click "Continue" after entering your account information. You can now view your photos. Go to Disney's PhotoPass website. Enter your email and password at the top of the page and click "Sign In." Type in your Disney PhotoPass ID if prompted and click "Go." The website will ask you to enter your ID if you did not previously enter the information when you created your account. Click the album you want to view if there is more than one set up. Photos are separated into albums based on the places you visited. Select "My Albums" at the top of the screen if you are on individual pictures and want to go back to the album view. You can view photos 24 hours after your visit. They appear on your account for 30 days.